More than a week after Florence crashed into the Carolinas, dumping heavy rains, all that water is nearing the coast. Authorities in Georgetown County, South Carolina, said they have put as many as 8,000 people on alert for possible evacuations starting Monday in expectation of a "record event" of up to 10-foot floodwaters this week. Officials are especially eyeing gauges along the Pee Dee and Waccamaw Rivers and said people should be ready to leave homes in the potential flood zones before possibly life-threatening flooding begins setting in as early as Tuesday. Georgetown County’s emergency management director, Sam Hodge, said in a video message posted online Sunday that shelters are being opened Monday for area residents and he pleaded with people to alert neighbors and friends to the possible dangers ahead. The community also was distributing free sandbags but said Monday was likely the last day to rush preparations before the affected should get out. “From boots on the ground to technology that we have, we are trying to be able to get the message out,” Hodge said in the video feed, advising people not to await an official evacuation order should they feel unsafe. The flooding has been going on for days in neighboring North Carolina already, the water slowly meandering to the coast. In North Carolina, five river gauges were still at major flood stage and five others were at moderate flood stage, according to National Weather Service. The Cape Fear River was expected to crest and remain at flood stage through the early part of the week, and parts of Interstates 40 are expected to remain underwater for another week or more. But floodwaters already receding on one stretch of Interstate 40 left thousands of rotting fish on the pavement for firefighters to clean up. 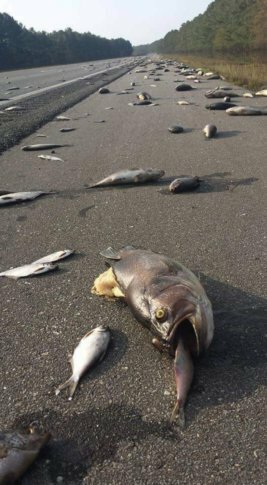 Video showed firefighters blasting the dead fish to the highway shoulder with a fire hose in eastern North Carolina. North Carolina Emergency Management Director Michael Sprayberry said that eastern counties continue to see major flooding, including areas along the Black, Lumber, Neuse and Cape Fear rivers. Elsewhere in North Carolina, state environmental officials also said they’re closely monitoring two sites where Florence’s floodwaters have inundated coal ash sites. “Florence continues to bring misery to North Carolina,” North Carolina Gov. Roy Cooper said in a statement Sunday evening. He added that crews conducted about 350 rescues over the weekend and that travel remains treacherous in the southeastern area of his state. But he said National Guard members would be shifting next to more door-to-door and air search wellness checks on people in still-flooded areas. Waggoner and Robertson reported from Raleigh, North Carolina. Also contributing to this report were Associated Press writers Jeffrey Collins in Columbia, South Carolina and Michael Biesecker in Washington.